The Fun Monkey Bars playground equipment is just the outdoor toy your kids are going to want to play on all of the time. The set has three places to start the climb and one long trail to swing down, plus a half trail that meets up at the center point. This fun piece of kids' playground equipment will be perfect as an add-on to your backyard play area or as a stand-alone toy in a community or school playground. Monkey bars will help your child develop their fine motor skills, which will help them be able to write better! Did you know that your child's hand muscles are the last muscle group to develop? Our bodies develop coordination of muscle groups by allowing the large muscle groups to go first – so we can walk and then run - then the small muscles in the hands and feet. So if you allow your child to play on monkey bars, they will build the muscles in the hands and 'teach' your child's hand muscles how to coordinate with each other. Why Choose Monkey Bars from CubbyKraft? 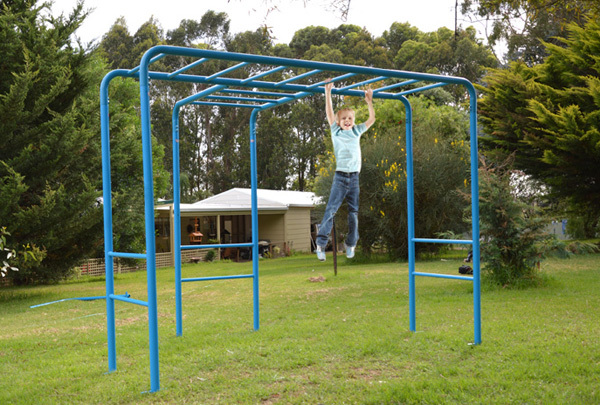 Monkey bars are one of the best outdoor toys for encouraging kids' fitness. The coated steel structures of the Monkey Bars sets offered through CubbyKraft are rated #1 for maximum durability and weight support for metal playground equipment. The safety features included in the design of our Monkey Bars - their low height and steel strength - has vastly improved the climbing experience offered today. Your child will love hanging on the rails, doing chin-ups or pull ups, climbing across, and swinging just like a monkey. It's a great way to play outside, order yours today! Safety, as well as fun is of chief concern at CubbyKraft. Finest materials were used to develop the Fun Monkey Bars set, which makes it is rust free and extremely durable piece of outdoor playground equipment. The height of the bars is at standard levels to ensure safety. The Fun Monkey Bars are available on their own or they can be part of an entire backyard playground with swings, cubby forts and cubby houses. Take a look around our site to see all that CubbyKraft has to offer - you won't be sorry you did! 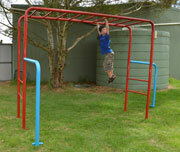 The Fun Monkey Bars kit can be shipped anywhere in Australia. It can easily be assembled by anyone by just following the guidelines provided with it. Do-it-yourself consultants are always available to give you a hand through email and over the phone during normal business hours. Instructions are clear and easy to follow, clearly labeled you will be able to put this together and if your children are old enough, you may want them to help. It will make them feel like they had a special job building their own monkey bars. Select your Playset from above and complete the details below to place your order. Note for security purposes we do not process you payment online, but will contact you for payment and to arrange delivery once your order is received.